Love Thai Curry & Glass Noodles? Thai Crate is a delivery-only place that does fresh and authentic Thai dishes. If you’re someone who’s obsessed with this cuisine, you should probably already put these guys on speed dial. 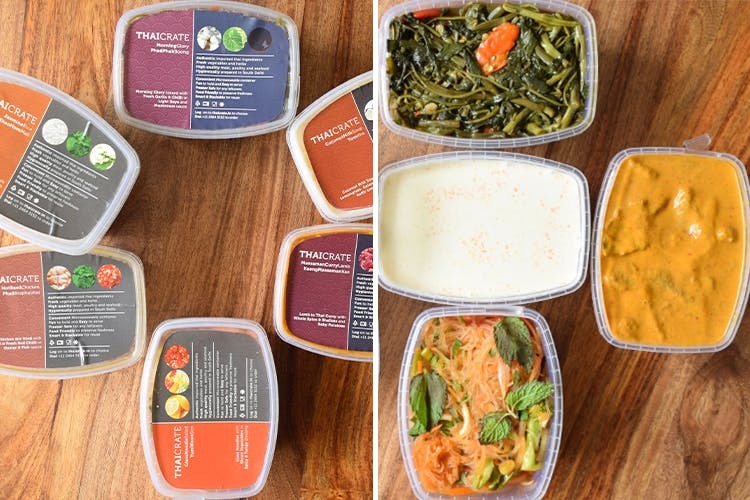 Thai Crate has been around for a while, but they’ve recently compiled new curated menus like Classic Thailand, Veggie Joy, Fresh & Fit and Coastal Special. Coming to what our favourites from these menus are, the Masammam Lamb curry is hands-down the winner. It’s a thick, coconut-y gravy with generous lamb chunks that are so soft and flavourful. We’re also a fan of their fresh veg Glass Noodle Salad. The manchurian-tasting Hot Basil Tofu and the Coconut Soup are also a hit among the vegetarians. The Non-Veg Meal Combo comes with an appetizer, a main course chicken stir-fry and a portion of steamed rice. Papaya salad / Veg Glass Noodle Salad / Veg Spring Rolls / Pepper Garlic Vegetables / Chilli Plum Sweet Potato. Hot Basil Chicken (sliced / minced) / Cashew Chicken / Black Pepper Chicken / Ginger Chilli Chicken / Thai Coastal Chicken / Broccoli Chicken. The Veg Meal Combo includes one appetizer, one main course vegetarian dish and a portion of steamed rice. Hot Basil Soy / Assorted Vegetables / Chilli Basil Greens / Shitake Pok Choy / Cashew Mushroom.